Thank you to Spanish Arborist Miki Sánchez who has written this fantastic review of his experience at the UK & Ireland Tree Climbing Competition which took place at the University of Exeter on 8th-10th September. When I saw that the Organisers of the UK & Ireland Tree Climbing Championship were looking for volunteers, I contacted them to get involved and have really enjoyed the experience. Social networks have their negative aspects but are a tool that facilitates things that years ago, would be unthinkable. I was in contact with John Trechard and Arboricultural Association, my request was very well received and I began to receive information of the event like schedules, rules, accommodation. Great organization from my point of view, and when you are coming from a foreign country this gives you peace-of-mind. I started the trip leaving from the T-4 Madrid, very early. I expected several hours of travel combining plane and train. After getting on the last train in time to Exeter I was able to be relaxed and enjoy the green landscapes, the changing weather with its lights and the scenery; Britain! At last I was at the University of Exeter, I just needed to be able to drop the luggage and go to the organization before the meeting of judges and volunteers. I met John Trenchard, head judge, and then I was introduced to all the people involved as judges and volunteers. From there, between showers and clearings, we would pause until the equipment check. After a good shower and food, I was ready to ‘introduce myself in society’. It’s quite an experience to see people that you know about Facebook. I met Jo Hedger, 2nd ITTC ’17. I was able to interview her last year. As soon as we exchanged a few words I knew it was not the time to entertain a competitor. Vans continued to arrive at the parking and competitors presented their material to the judges who meticulously evaluated each item and asked the competitor any questions about their use. At the end of the safety check we went to dinner to an authentic English Pub, for me at least. With a good pint and some food, you have the ingredients to break the ice and get to know the people better. An hour before the start of the Championship the organization, judges and volunteers had a meeting. It was about organizing the work, preparing the tests and finishing details. This edition introduced an important change in ISA Competition. The Footlock test has been replaced by an “Ascent” test. It tries to assess the safety, speed, efficiency and response of the participant. 1: Time to install the system and check it. The participant had to open his arms to mark the end. 2: Ascent time from the ground up to a height of 19 m. The participant had to ring a bell upon reaching the top. 3: Once above the participant had to prepare his system for the descent and then they need to ring the bell to stop the time. This test also valued the use of added safety measures: a fall arrest in a parallel rope, for example. It was interesting to see the techniques chosen by the participants and their efficiency. My role as a volunteer was to support the development of the evidence. I was involved with the Ascent test and the Fast Climb. I had a great welcome and the camaraderie amongst the team helped me feel part of the group. The participants were distributed in groups that would compete on the different stations. The Throwline test was performed on a Pinus silvestris. The placement of the rope gave an extra score. The Fast Climb was performed on a great Pinus nigra, I had the chance to climb to dismount the tapes and ropes. It was demanding and I needed some water afterwards, but the views were excellent. The Rescue test simulated an accident scenario where the victim was suspended on a branch, away from the trunk. The participant had to place an access rope and a work rope before performing the rescue. The Work Climb was in an amazing Cedar; it had multiple branches from the bottom and Its structure allowed a beautiful challenge. Throughout the day, the participants performed the tests then at the end of the day they found out the results and who was in position to qualify for the Masters events on Sunday. Due to the possibility of rain, the Masters events were bought forward to 9:30 a.m. The events took place on a spectacular cedar. The most complicated and essential was to place the rope as high as possible, because that, as we know, facilitates a lot of work. Speaking to a mate, I said: “The throwline is 50% of the work. He replied: – I would say that it is 80%! Throwline was challenging in this tree. The climbers all showed great skills in their abilities; strength, planning, etc. and there was an amazingly high level of competition. The system most used was SRT with Rope Wrench, although some decided to combine it with DRT. I was fascinated by the style of Tadhg, which reminded me of the style of a good mate of mine. I liked how Jo Hedger planned her challenge and how she solved it. I really liked Graham Birds’ plan He took advantage of the Twin Rope of Art. From Boel I admired the way she managed the situation. She tried and decide different options until the end, very skilled. Michael did a great participation, very fluent, technical and talkative. He decided to add friction with a figure 8 in his RW setup! Good detail. Once the trials were over, everything was in the hands of the judges. Even having the scores obtained was difficult to define the positions because all participants were high level and despite having different styles turned out to be very efficient. 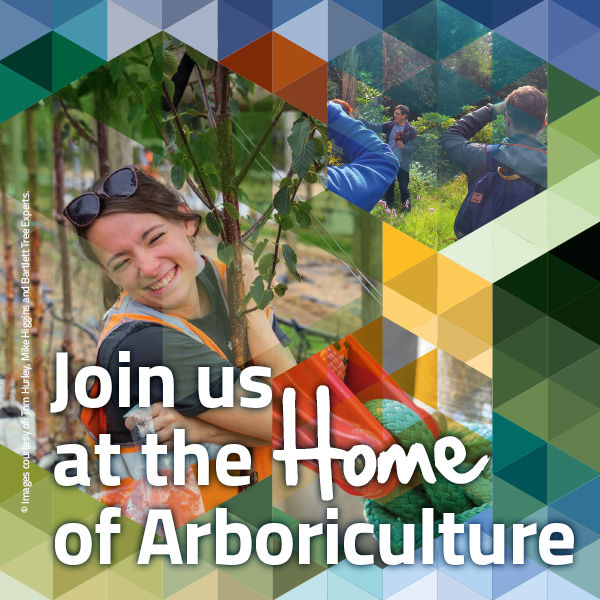 This is the first time in 20 years that the Arboricultural Association, (AA), an Associate Organisation to the International Society of Arboriculture, have organised this event, and they really did well, with everyone well catered for and all events fully staffed with volunteers from within the industry. Much credit should be given to all those who worked so hard to pull this one off with a very limited time frame to work to! Was also able to talk with Francital. I like their articles and I use them in the day to day. The technology SoFly can make light safety pants. Good clothes thought for the arborist. I want to thank them for their presence. The awards ceremony was held in a University Hall. There began the preparations “The 51st National Amenity Conference 2017”. And that is one of the reasons because the championship is organized in September. It makes easy the organization and allows to integrate both events. It also can be great to the Finalist that want to go to the ETTC in order that they can train focusing in the European Champ. and maybe can help to finalist to save some money for traveling to Paris’18 ETTC. When I went in and saw the prizes on the table, my mouth was watered. There were prizes from Teufelberger, FTC, arboriculture books like K.Mattheck books, etc… Awesome!!! I will like to thank the sponsors their effort: FTC, Francital, Honey Brothers, Husqvarna, Sawpod, Lyon, Arboricultural Association. Everyone had their moment of recognition. It was a party and was very nice to be able to see the participants and their loved ones and friends gathered. Good atmosphere. The feeling I took is similar to any championship I’ve been in Spain. A championship is the perfect excuse to bring together people from the industry who often cannot stay together during the year. A weekend party that is possible thanks to the effort and dedication of the Organization, Sponsors and above all the participants. And… don’t forget Trees! I am convinced that I will do my best to attend the next one, surely encourage me to participate and enjoy climbing amazing trees.